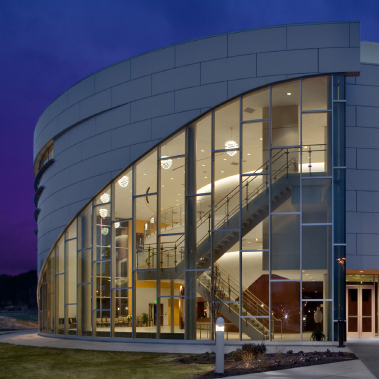 The study for a new Performing Arts Center at Rock Valley College, addresses the college’s desire to replace its current undersized and outdated performance venue with a new 330 seat Thrust Theater and a 500 seat Music Performance Hall. The new Performing Arts Center will also serve to enrich the cultural core of the campus while increasing the visibility and quality of the college’s Theater and Music programs. The location of the Center, adjacent to the college’s current open-air theater, creates a vital outdoor courtyard space between the two venues for pre-function gathering, activities, and events. A glass enclosed Lobby welcomes patrons to the new facility while providing framed views of the courtyard and the adjacent open-air theater. A glass enclosed stage at the Music Performance Hall provides an indication to passers-by of the energy and activity happening within, as well as offering patrons a backdrop that visually changes with the seasons.